How would you prepare readers going into this book thinking this will be like The Wednesday Wars? I also loved this book, but my wife found it too difficult to read. This was because of the heartbreaking moments which you don't experience 1st hand in Holling's life. The Really Bad Things happen around Holling, but not necessarily to Holling. In Okay For Now, The Really Bad Things happen to Doug. Is it because Holling's life is almost a charmed life? And Doug is just charming? I told my students that it is a spin-off of The Wednesday Wars, but sadder. I think it's very similar to THE WEDNESDAY WARS, and I think Holling's desire to be his own person will prepare readers for Doug's desire to do the same. I also think readers will enjoy getting to know Doug beyond what is learned in THE WEDNESDAY WARS - his list of ways to get a teacher to hate you and "Doug Swieteck's brother." The physical abuse that Doug experiences is more than Holling deals with, but other than that I'd say most of the really bad things happen around both of them. A sibling that is arrested and a sibling that runs away. A threatened marriage due to abuse (although signs point to a positive end) and a threatened marriage due to a career. Soldiers who die, return injured, and return healthy. 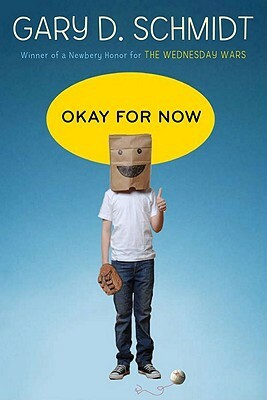 I'm not sure I agree with you about OKAY FOR NOW being sadder. We can say that Doug dealt with worse circumstances, but then shouldn't we say he also achieved greater accomplishments? His oldest brother and Coach Reed, reading, his father, Audubon's book, Broadway - all have incredible resolutions facilitated by Doug. I was happy for Holling when he told his father that being a man wasn't about a job but about choosing for yourself, but I was beyond happy - absolutely thrilled - with each of Doug's achievements.